The woman who became famous across the world for her remarkable Skittles dress has now made a skirt and top from pubic hair. Mother-of-two Sarah Louise Bryan made a name for herself after designing a dress made from 3,000 Skittles. And after gaining notoriety for her wacky creation, Sarah, 28, didn't want to stop there. 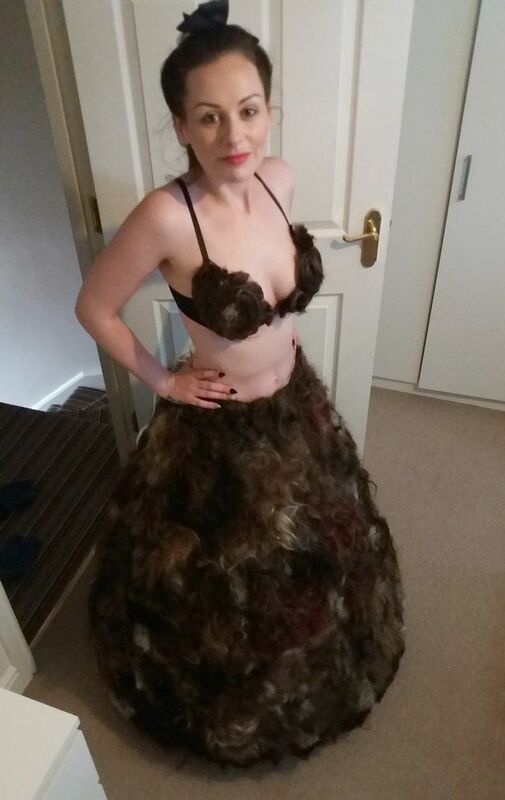 She has now made a skirt and bra outfit made entirely from human hair. The outfit is mainly made-up of other people's pubic hair, donated to her over the course of six months. She appealed on social media for people to donate their pubic hair, and other bodily hair if they so wished. Sarah said she received thousands of responses, with people wishing her luck in her new project. Speaking about her latest hairy creation, the former beautician said: "I decided to make another design following the Skittles dress, I wanted to beat Lady Gaga 's meat dress. "I wanted to beat her at the title of most disgusting dress so with the help of asking for pubic hair on Twitter."